There is a West Bergholt, but it is away in Essex, on the other side of Colchester, and to most Suffolkers ours is simply Bergholt. It is, in fact, one of Suffolk's more populous rural parishes, but doesn't appear so, because of the way the village staggers out into hamlets and settlements. It has more pubs than any other village in the county, and if all the houses were gathered together it would probably be considered a small town. Many of the people who live here commute to Ipswich, Colchester and Manningtree, which is surprisingly close. Indeed, part of East Bergholt runs into Brantham, itself virtually a suburb of that Essex town. One of Bergholt's hamlets is more famous than Bergholt itself. This is Flatford, which after Sutton Hoo is probably Suffolk's single biggest tourist attraction. The Mill and Willie Lott's Cottage were both derelict by the early years of the 20th century, but they were rescued and restored. Today, thousands of people visit them every year, enthusiastic Americans rubbing shoulders with courting couples and badly behaved schoolchildren. In summer you can't move here, the ice creams cost a fortune and the queue for hiring boats is like something out of Disneyworld. All this, of course, is the fault of the artist John Constable, whose paintings of the mill pond and the buildings beside it can be found on a thousand calendars, placemats and chocolate box lids. Along with that of Thomas Gainsborough, who was born a few miles away, Constable's work is considered by many to sum up the spirit of Suffolk and its wide open skies. But both had to leave the county to achieve fame and fortune. Unlike Thomas Hardy, whose work constantly harks back with nostalgia to the Dorset of his youth, both Constable and Gainsborough moved on to other and greater things. Constable's work appears so safe to us today, it is hard to remember that it was considered controversial at the time. The genius of Constable himself was never recognised in England in his lifetime, it was the French who acclaimed him, and it was in Paris that his pictures caused a sensation. But then, there are so many things that the English have needed the French to take a lead in, without wanting to admit it. Constable is famous for being the miller's son. Actually, his father was the mill-owner, which isn't quite the same thing. White's 1844 Directory of Suffolk lists him as a corn miller and coal and corn merchant. He was a businessman, and also owned the mill up river at Dedham. The young Constable had the leisure to paint, but as he grew older, he was frustrated by not being able to make a living out of it. He finally achieved security, and the freedom to follow his vocation, by marrying into money. His wife, Maria Bicknell, inherited £20,000, about four million in today's money, from her grandfather, who was the Rector of St Mary. The church stands in as idyllic a spot as you'll find, surrounded by substantial pretty houses at a turn in the road. Across the way stands Old Hall, a huge agglomeration of 19th century buildings looking rather like a workhouse. The statue of Mary facing across to the church might make you think Old Hall once had a religious purpose, and you'd be right. If you approach the church from the east, you are presented with a splendid late Perpendicular exterior. The unfinished eastern face of the nave shows that a similarly grand chancel was also planned. Here is the wool wealth we have met nearby at Stoke-by-Nayland, Stratford St Mary, and all the way up the Stour valley. Here are the devotional fruits of the industrial heartland of 15th century England. If you were wealthy in those years, you added something to your parish church as a focus for the prayers of the living after your death. You wanted to spend as little time in purgatory as possible, and if you were wealthy, you might have more reason than the poor to suspect that you might not make it into Heaven in a hurry. If your parish had lots of seriously wealthy people, you pretty much got the whole church rebuilt. This happened at Lavenham, and Long Melford, in Sudbury and Glemsford, and a dozen or so other places. And it happened here. Throughout the 15th and early 16th centuries, a succession of wills bequeath money for the building of chapels, aisles, clerestories and rood turrets. The interior was beautified and magnified. Among the benefactors were the De Veres of Old Hall, and the Coles. Today, the exterior is stunning, a festival of stone and flintwork, a testimony to the quality of the materials of half a millenium ago. Love and money were lavished here. And then, you wander up to the west end of the church, and the illusion of medieval wealth and permanence dissolves. For here, you find the haunting ruin of a vast tower base. It reaches barely to the level of the clerestory, and then peters out in a confusion of fixtures and footings. Time has melted them, five hundred years exposure to the elements has given them strange curves and contours. And, inevitably, you ask what happened here? All over Suffolk, you find the remains of collapsed towers. Flint and rubble are high-maintenance materials, and why not? At the time of the construction of our medieval churches, there was no reason to think that a day would come when there would no longer be a will to maintain them. It seems extraordinary to us now, but it was no different to the way people put up high-maintenance, high-energy-consumption buildings in the cheap fuel optimism of the 1960s. It was the Reformation that did for the churches. Suddenly, fixtures and fittings were foolish, vainglorious and superstitious things. The preaching of the Word and the creation of a National Church were the new order. Purgatory disappeared in a puff of logic, and several centuries of neglect set in. Towers collapsed throughout the 17th, 18th and early 19th centuries. At Alderton, the tower came crashing down during divine service one Sunday morning in 1821, killing a cow. I assume that the cow was outside the church at the time. Something had to be done, and it was the Oxford Movement revival of the Church of England that led to a renewed interest in the buildings and fabric. The Victorians are accused of ruining churches, but in most places they actually saved them from oblivion. At Stanton All Saints, the church was almost completely rebuilt, except for the tower, and as a consequence it was the tower that collapsed, as recently as 1906. However, none of this applies to East Bergholt. Quite simply, the tower here was never built. Here we stand, looking at a church on the eve of the Reformation (ignore the red brick facing and the funny little turret, an 18th century affectation). A few miles away at Dedham and Stratford, wonderful towers were raised to the glory of God and for the salvation of the souls of their benefactors in the early years of the 16th century. And an even more glorious one was planned here, but the Catholic Church ran out of time. The reformers took over, the wealth of the parishes was appropriated to the Crown, and East Bergholt's tower would never be built. 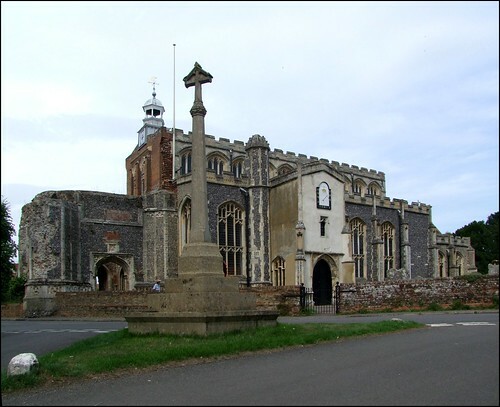 There is a story, widely believed in Suffolk, but firmly debunked by the church guide I must add, that the reason the tower was not built was that the materials were diverted by Cardinal Wolsey for his College in Ipswich, and that his fall from grace meant that funding dried up. There is no evidence for this tale, and probably the myth has arisen because one of the benefactors of the proposed tower was a local family by the name of Cardinall. That the tower was commenced in a fit of optimism, there is no doubt, for barely discernible now, but recorded within the last century, is the date 1525 inscribed on a pediment. Building the tower hard against the western boundary of the churchyard meant that a processional way had to be built beneath it. You can see the same thing at Combs, Ipswich St Lawrence and Stanton St John. The extraordinary skill of the 16th century master-masons enabled a wide, high archway, and what seem impossibly narrow corners. It is these, perhaps, that have encouraged visitors over the years to think that the tower collapsed because it was unstable. The absence of a tower has given St Mary something you'll rarely see elsewhere in England, although there are a couple near here just over the Essex border. If you wander around to the north side of the church, you'll find a medieval bell cage, which you can peep into, and see the five bells at close quarters. This dates from 1531, and is all the more remarkable because it was probably built as a temporary structure. The bells are the heaviest peal of five in the world, and were rung by hand, until there was a terrible accident in 1999. Because of this, the bells were among the few Suffolk peals not to ring in the millennium. But they have since been returned to use, after a major project to make them safer. It is worth visiting on a Sunday morning to see them rung. Beside the bell cage, the rood turret rises like a castle keep. The star of the De Veres is bold upon it. The church looms above you, a sense intensified by the tightness of the graveyard. A mighty tower here would have been a remarkable thing. You walk through the fascinating graveyard back around to the south side, and enter by the substantial porch. You step into an almost entirely 19th century interior. But before we blame the Victorians for too much, remember that this church was probably entirely scoured by the Anglicans and the Puritans in the 16th and 17th centuries. There is considerable evidence to show that the 17th century puritans were particularly strong in this parish, and that protestantism had a free hand in the destruction of the interior of the church. The government's official visitor to the churches of Suffolk, William Dowsing, lived in the adjacent parish of Stratford St Mary, where the minister was sequestered for his sacramentalist beliefs. But Dowsing didn't even bother to visit East Bergholt, suggesting that he knew the church well, and did not think there was a need to do so. In addition, the protestant credentials of the minister here were never questioned. By the 18th century, St Mary contained box pews, a preaching platform, texts on the walls, and probably not a lot else. This was entirely unsuited to the liturgical requirements of the 19th Century Oxford Movement revival, which sought a return to the sacramental religion of the medieval Church, and so the inside St Mary underwent a complete refurbishment in the 1860s and 1870s. And it is all done well enough, if a little severely. It is good that the brick floor survived. The gloomy windows lend the nave a degree of gravitas, and the austerity of the 1920s rood beam makes of it a serious thing. The font is a Victorian curiosity, very like that at Stratford St Mary, unfamiliar in Suffolk, but found in a thousand urban Anglo-catholic temples. There are some medieval survivals. In the north wall of the sanctuary stands a heavily restored Easter Sepulchre. At the back survive traces of medieval paint, probably a representation of the risen Christ, which would be concealed by a veil until the first light of Easter morning. Also in the sanctuary are an image niche, and traces of a consecration cross. But it is the 18th, 19th and early 20th centuries which give St Mary its particular character. In the north aisle is a small memorial to John Mattinson, who was for Eleven years the Beloved School Master of this Town, and then Unfortunately Shott the 23rd November 1723. I wondered if he suffered this fate during the execution of his duties. Nearby, another inscription reminds us that what ere thou art here reader, see in this pale glass what thou shalt be, despised worms and putrid slime, then dust forgot and lost in time. Thankfully, given that there is so much of it, the 19th century glass is good, especially in the south aisle. I am intrigued by the 1873 glass in the south aisle chapel which remembers a woman who loved much, but which does not name her. The 20th century glass is even better. Most of it is at the west end, but the very best of all, a fabulous Virgin and Child by the great Francis Skeat and probably dating from the 1930s, is now almost completely obscured by the organ. Isn't it strange, the way that churches in tourist hotspots attract so many visitors? Perhaps it is because visiting the parish church is an essential way of getting to the heart of a community, a touchstone down the centuries. That is certainly true at East Bergholt. Wandering around the cluttered graveyard, and spotting the pleasing and elegant red brick tomb chests, I had an impression of the independence and prosperity of a large English village in the centuries before the world would it change forever. It must always have been a pleasant place to live. In 1844, White's Directory comments on its well-stocked shops and handsome mansions. At the time, there were about 1500 inhabitants, but it had once been larger, a market town no less, although the market had fallen into disuse by the 18th century. It must have been well known to travellers from London heading into East Anglia, handily placed halfway between Colchester and Ipswich for the watering of horses and stopping for provisions. But times change. East Bergholt was more or less bypassed by the industrial revolution. This quietness was itself a symptom of change, because a typical Victorian rural settlement busied itself here, and remembered itself in its parish church and is thus still essentially visible to us to day. Here is the sense of a constant change, a touchstone; here is what happened to us.